The Sky is Everywhere* by Jandy Nelson. This one is all over the board as far as emotions go. Sometimes I laughed…there was also lots of tearing up. Sometimes the characters made me incredibly angry and more than once I ended up a swooning puddle on the floor. What more can you ask for in a book, really? Tea Rose by Jennifer Donnelly. Whoa buddy did this book make me cry. Inside these pages is one of my most beloved characters of all time. Nicholas Soames, I wish you were real. Not because he is swoonworthy – that isn’t his appeal. He is desperately complicated and imperfect – but such a good person. Seriously – I don’t know how you could read this book and not be affected by his story. Harry Potter & the Deathly Hallows by J.K. Rowling. This one is easy. The culmination of the best series of all time. Deaths aplenty – but worst of all is the simple fact that this is the end of something incredible. A Monster Calls* by Patrick Ness. I just talked about this book in my Halloween vlog yesterday! Truly difficult insight into the inevitability of loss. Hug your family, prepare yourself and dig into this one y’all. Prepare to sob. We’ll Always Have Summer* by Jenny Han. Okay – this is a strange choice, I know. But I really got invested in these characters and I was a hyper mess while reading this book. Just ask Shanyn. She was the one that had to hear all my “OH MY GOD! DID YOU READ THIS PART?”s. These characters really had to work for their happy ending. Don’t Tell* by Karen Rose. Again – this was in my Halloween vlog. I’ve never so fully appreciated getting into the mind of a sociopath. Brilliant writing. Also – all the characters that aren’t evil are so easy to fall for. I was probably more emotionally invested in this book than any other. Ever. Kushiel’s Avatar by Jacqueline Carey. The last book from my Halloween vlog. These characters had to travel to a distant country that basically parallels Hell. Scared the bejeezus out of me. Turn-the-lights-on-and-hide-under-the-covers-while-whimpering scared. Kiss It* by Erin Downing. Another odd choice – but this book was hilarious! It ended up having serious themes of course, but holy goodness did I laugh while getting there. I read the first section about 10 times before I could contain myself sufficiently to continue. I was wiping tears out of my eyes from laughing so hard. Open Season by Linda Howard. Another hilarious read. This one is romantic suspense, but the character is a virgin librarian who decides its time she got a life. From trying unsuccessfully to apply mascara for the first time to buying a huge box of condoms for attention to accidentally punching a guy’s balls in bar – you will die. Absolutely hi.la.ri.ous. Life As We Knew It by Susan Beth Pfeffer. This is by no means my favorite dystopian, but it was so realistic. Running out of food – no electricity – the writing made these things so real. I was staying with my parents on a school break while reading it, and I remember walking down to dinner and being momentarily stunned at seeing full plates on the table – I literally almost asked my mom where she’d gotten all that food. That is how lost in the book I’d gotten! * – Links go to my reviews! The Summer series was definitely emotional! And I have the second book in the Life as We Know It series on my list … the whole series is very intense, gritty, and realistic (for an apocalyptic book). I need to read A Monster Calls – I wouldn’t have expected it to be so emotional but this is the second time I’ve heard it described in relation to sobbing. And I also got a lot more invested in We’ll Always Have Summer than I expected. I’ve heard so many good things about a lot of the books on your list although I haven’t read them! I’ve been recommended The Tea Rose books and they’re all on my TBR. I’ve also heard awesome things about The Sky Is Everywhere so I must track them down too. And I don’t know how I’ve come this far and never read anything by Patrick Ness, but I have. You’ve definitely given me some books to make sure I grab soon! 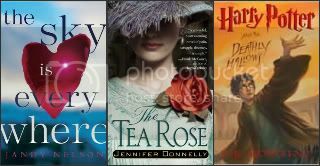 I haven’t read The Tea Rose but could have added Revolution by Jennifer Donnelly to my list as it was definitely a very emotional read. I will also have to check out Ness’s book as I loved his Chaos Walking series and it was quite emotional too. Great list. Deathly Hallows was the end of something incredible, and hearing it put that way, makes me pretty sad. 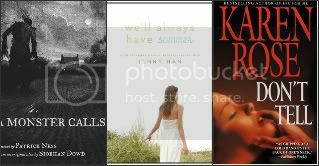 I need to read the last book in the Summer I Turned Pretty series, but I’m afraid to. Monster Calls sounds good. Nooooo I don’t want to get to the end of the HP series!! 🙁 I know what’s coming. And I don’t want to. I have The Sky Is Everywhere and HP and the Deathly Hallows on my list too. I just read The Sky Is Everywhere and I cried quite a bit. The books on your list sound so good. I loved A Monster Calls too. Great list! I’ve been meaning to read Tea Rose and the Kushiel series – I’ll have to move them up on my to-read list. third time I seen the sky is everywhere. so i will have to put on my 2012 TBR list. I’m very curious about The Tea Rose – I’ve never heard about it before but you’ve got me curious! I put Kiss It on my wishlist ages ago, and then forgot all about it. I’ll have to read it now! I remember being interested in The Sky is Everywhere too, but I forgot about that one too! Ah me, too any books! I actually really didn’t like Life as we Knew It, the main character just bothered me. And there are much better apocalyptic and post-apocalyptic YA books out there, it’s true!